If you’re anything like me, your cell phone is usually within two feet of you at all times. Whenever you see something really amazing, you rush to the camera on your beloved iPhone. You might even find yourself feeling completely disconnected when you haven’t been on Facebook for a couple days… or hours! Don’t worry, I get it, but when it comes to the big occasions, be all there! Unplugged Weddings are the solution to our phone and camera obsession. More so, they really help guests be fully in the moment. An Unplugged Wedding is where brides and grooms ask friends to ditch the phone and completely live in the moment of their wedding. I love this idea! There’s nothing worse than a sea of heads looking down at their laps when you’re saying “I do”, even if they are Instagramming a picture of your adorable mason jar lantern. Plus, you don’t want the love shared at your wedding to be experienced through a viewfinder! While I understand it’s hard for guests to abandon their techy-sidekicks (Hey, It’s hard for me too!) there are so many plus sides to asking them to check their devices at the door. As you can imagine, cell phone pictures and flashes are weddings photographers’ worst nightmares. 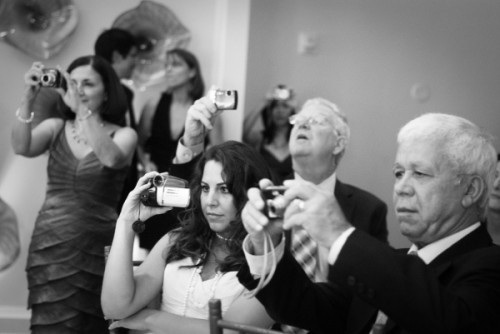 Photographers’ hearts break when guests jut a cell phone in front of their perfect shot. Or even worse, when hundreds of flashes ruin a shot…just take a look at the picture below. It’s such a nice gesture when guests try to snap the best photo possible with their own camera, but unfortunately they usually just end up in the way of the professional shot. Look at this bold guest! 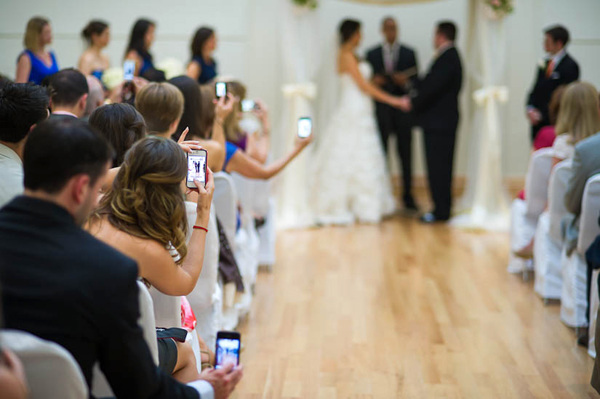 Even more than ruining professional photographs, guests with cell phones glued to their hands just doesn’t seem right at a wedding. 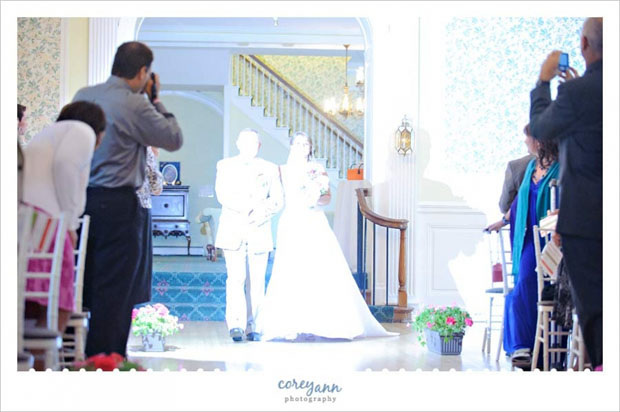 Sure, capturing moments are important but that’s why you hire a photographer. The complete attention of all your guests is something I am sure you want during your special day and you deserve it! It would be a shame for all your friends and family’s smiling faces to be hidden behind their phone or camera. Sadly, the picture below looks all too familiar! So how do you ask your guests to ditch their devices without bothering them? 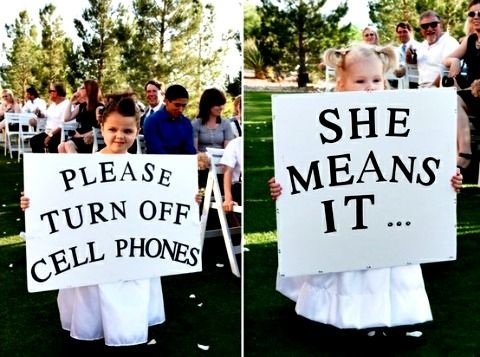 Brides and grooms everywhere have found cool and creative ways to kindly ask their guests to unplug during their wedding. Small cards explaining the unplugged wedding can be placed on each seat at the ceremony or even at each table setting. Whatever way you choose to ask guests to turn off their cell phones and keep their cameras at home, it is definitely worth it! An Unplugged Wedding is a great way to make sure your guests fully experience the joy and happiness of your wedding. Who knows…they might even like being off the grid for a while! Your groomsmen are your best buddies — guys who have been there for you through thick and thin. And on the most important day of your life, they’ll be there for you once again, standing by your side as you take the plunge. In return for their longtime friendship and for coming to support you in getting hitched, it’s tradition to bestow upon each of them a groomsmen gift. A groomsmen gift should be something that fits into the classically masculine category — style, vices, hobbies (like golfing or letter writing), etc. It should also ideally be something your buddies will actually use; no guy needs another knickknack sitting in his desk drawers. For this reason, while giving gifts that are personalized/engraved is a popular choice, as a general rule of thumb, it’s best not to get the item inscribed with “Groomsman” and/or your wedding date; it’s an important day for you, but let’s be honest here, nobody wants to use a money clip or Zippo lighter with your anniversary emblazoned on it. When personalizing your gift, go with just your groomsmen’s initials or names instead. If you’ve been stumped as to what gifts to get for your groomsmen, below we highlight both classic and unique options, from a wide range of price options, that are sure to be winners. A nice, simple leather wallet — as opposed to the cheap corner market variety — is more likely to replace the duct-tape version in your friend’s back pocket. 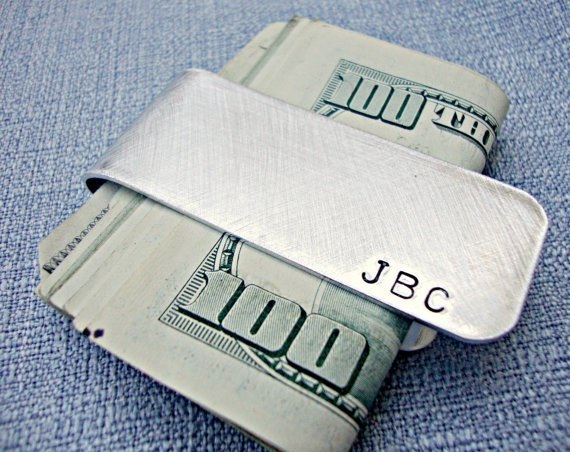 And a metallic money clip (as well as some leather wallets) can be engraved with your buddies’ initials or a favorite quote. When John F. Kennedy got married in 1953, he presented each of his groomsmen with an engraved Brooks Brothers umbrella. 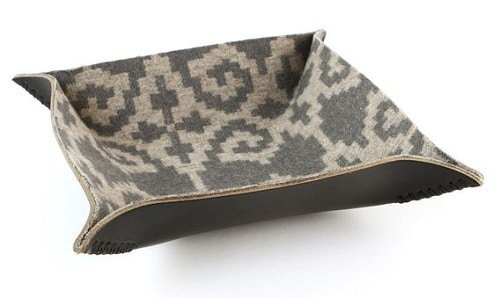 While it’s not something you generally think of as a gift for men, it’s a classy and unique item that is also practical, especially for spring weddings or rainy locales. It’s hard to find a personalized umbrella (especially online) that isn’t just another tchotchke, so call around to nice men’s stores in your area and see what they can do. Another option is to get a nice wood-handled umbrella — like this one from Barney’s — and find someone to put a small engraved plaque on it. 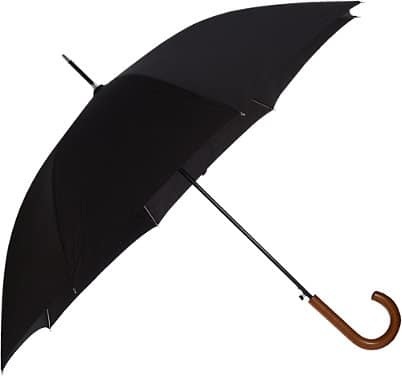 For more on what makes for a quality man’s umbrella, check out this post. For too many men, their EDC arsenal of a phone, wallet, keys, pocketknife, etc. get scattered about the house whenever they walk in the door. Rather than adding to that clutter, why not give them something to catch it all and keep it organized. Remember, “a place for everything and everything in its place.” It’s versatile too — it can contain your EDC, your watch collection, your suit accessories, and more. A man can never have too many quality, handsome ties in his collection. 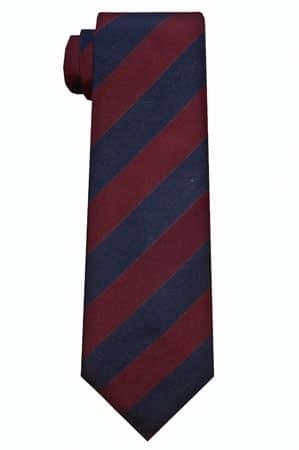 To honor your brotherly fraternity, give your friends all the same pattern of an unofficial regimental tie— a style which was originally used (and still is) to denote membership in certain clubs, organizations, or associations. Or give them each a unique tie that suits their particular personalities and style. While poker was once considered the game of outlaws, it’s made its way into the mainstream in the last decade, largely thanks to internet poker and ESPN broadcasting tournaments and events. A game with friends includes competition, gambling, danger (it still harkens to its crusty origins), and always a good amount of food, drink, and laughter. Give each of your groomsmen a nice set of chips, learn how to play, and rotate who hosts your newly-instituted monthly poker nights. 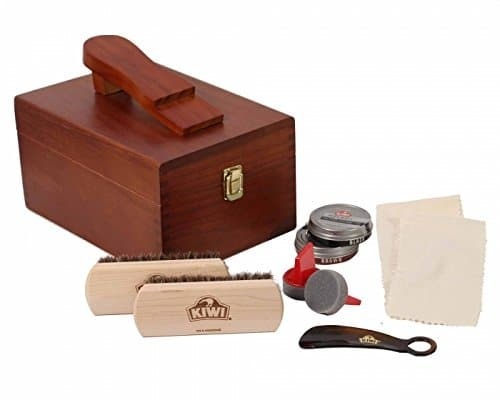 I can’t think of a better gift to bestow upon your groomsmen than an entire kit to help them start shaving like their grandpas. Our Art of Manliness box comes with a safety razor, mug, badger brush, and a puck of shaving soap. It also comes in a dang handsome wooden box. You could also consider getting them a straight razor. As you know, every man should carry a pocketknife. But don’t get your buddy a chintzy gift store knife, emblazoned with your wedding date, so he’s reminded of your anniversary every time he takes it out of his pocket. 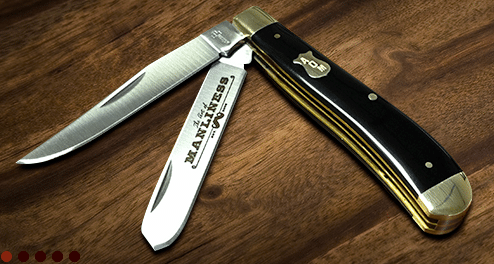 Instead, give him something that’ll always remind him of what an upstanding, all-around man you think he is by gifting the Art of Manliness pocketknife. Nothing’s more manly than building a fire without matches. 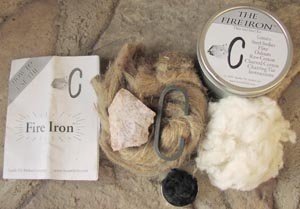 So if your friends are outdoorsy and you want to find them something unique (read: seriously cool) give them this flint and steel fire starter kit. It’s got steel, a flint rock, char cloth, raw cotton, tinder, and instructions all packed in a nice tin. They’ll be starting fires like real mountain men in no time. Well-shined shoes are essential to a professional appearance, but a surprising number of guys don’t own a shoeshine kit. Hook your friends up with a gift they’ll use throughout their lives. Help your friend upgrade from a crummy Bic ballpoint pen to the luxury of the classic fountain variety. There are a ton of cheap and even disposable options, but go with something nice that will get years and years of use. When your friend writes his information on the back of his calling card for a lovely young lady, he’ll be doing it in style. It gives him a chance to work on his crummy handwriting, too! 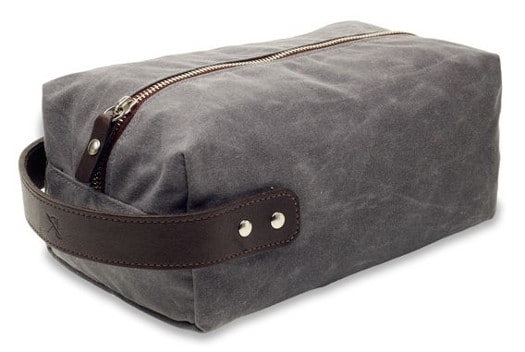 Every man needs a Dopp kit. Get your groomsmen a gift they’ll use on all their travels. Tell them to pack it up and not to be a stranger once you’re a married man. Let them know your door is always open for a visit. Some milestones in life are inflexible. High school proms are chained to rowdy adolescents and abundant awkwardness. Graduations require unflattering headwear, speeches, and crowds. Births, save the odd emergency, cannot escape hospitals, homes, and an unfortunate amount of goo. Marriage proposals, offer delicious flexibility, as they do not require specific dates, times, locations, surroundings, garments, or obligatory attendees. They present of the few milestones in which you can assume full control. While the classic choices, such as placing a ring in a champagne glass at a fancy restaurant, proposing at Christmas or New Years, and getting down on one knee in a beautiful park, are lovely, why not save "tradition" for those big life events that don't offer flexibility? As you make your engagement plans, I urge you to veer off the beaten path and consider these unique marriage proposal ideas. For the past hundred years, diamonds have been the go-to choice for engagement ring stones. One way to make a proposal unique is to propose with something unpredictable. "Unlike diamonds, colored gemstones are one of a kind," says Chloé Alpert of Teaman & Co., a modern jewelry seller that lets customers try on 3D-printed versions of their rings before they take the leap and buy them. "There will never be two colored gems the same; they are each as truly unique as a couple's love. Buying a colored gemstone engagement ring ensures you won't see another woman wearing a ring identical to yours." Many couples opt for diamonds thinking that they are the best way to show that no expense was spared when purchasing the ring. That said, Alpert argues that diamonds aren't the only precious stones in the world. "Just in the same way diamonds have various prices, some of the finest gemstones can be more expensive than diamonds -- it all comes down to quality." Alpert's co-founder, Alastair Trueger adds that, "in fact, the gemstone alexandrite is so extraordinarily rare that stones over about two carats can go for prices well in excess of a diamond of similar quality." So don't be fooled into thinking diamonds are the only stones suitable for posh ladies. While in heterosexual relationships, men have traditionally proposed to their female partners, this need no longer be the case. There is no rule barring any particular gender from proposing the prospect of marriage, and should a woman decide to buck the tradition, the couple's marriage proposal story will be all the more unique. If you consider yourself more likely to be the recipient of a marriage proposal, consider surprising your partner by orchestrating a proposal of your own. Just because you propose to your partner does not mean they can't surprise you later on with a gorgeous ring of your own. Though it is not common for men to wear engagement rings, it isn't out of the question for them to do so. You might buy an engagement ring made with unconventional materials, such as fossilized wood or tungsten, then swap it out for a ring made with a more expensive material at your wedding ceremony. Etsy offers a wide range of men's rings made with off-the-beaten-track materials. There is no doubt that you can find something neat that would make for a perfect engagement ring surprise. Alternatively, consider offering a nice watch, precious cufflinks, or some other form of accessory a man might wear daily. Many who march off well-trodden engagement paths leave the ring out of their marriage proposals entirely, offering something else in its place. Those who care little for jewelry would find an unforgettable proposal scene, a series of delicious meals, a special vacation, a vehicle upgrade, or a major living space upgrade to be far more meaningful than a ring. Of those who care dearly about jewelry, it might actually be safer to pick out a ring together after the proposal has been made. For that group of prospective life partners, consider offering a creative IOU with the promise of an engagement ring that truly suits their taste. It is not uncommon for couples to propose while on vacation, but usually it is just the fact that they are on vacation that they use for the special occasion. Consider taking your proposal one step beyond by planning something unique and unforgettable on top of a fabulous vacation and picturesque destination. Should you need professional help, there are people who can help you plan special marriage proposals in all sorts of places. There is even a company called ApoteoSurprise that specializes in Paris-based proposals alone. ApoteoSurprise is far from a small, new upstart. The company has been around since 2006 and has orchestrated nearly 1,000 proposals, including a tour in Cinderella's carriage with a magic shoe and a giant love note projected under the Eiffel Tower. Should the proposal destination of your choice not be Paris, a local travel agent, wedding planner, or hotel concierge can certainly help you with the basics. Many wedding planners also help with marriage proposals. Consider the UK-based wedding planning company Dream Occasions, which offers a marriage proposal service to clients all around the world. Though their basic packages cover ideas and help you brainstorm on the perfect proposal premise, they also offer more involved support (presumably for U.K. customers only) in which they hire vendors (such as a hidden videographer) and hover behind the scenes to make sure everything goes off without a hitch -- plus clean up any decorations that might be set up so that you can float off to celebrate your engagement. "I have had one client that asked us to help decorate his flat before his girlfriend arrived home, however there was a rather personal and unusual twist. As his partner loved chocolate so much, he asked us order and to lay personalized bars of chocolate throughout the flat leading into the bedroom with the bars getting bigger. We decorated the entire bedroom with candles, roses, lilies and rose petals everywhere, meanwhile the proposer decided to cover his upper body completely in chocolate! We did ask him if there was a reason to this apart from the obvious... and he replied with "Well she loves chocolate so much, and she never says no to it, so I figured if I was chocolate... she can't say no to me!" I absolutely thought this was just amazing and hilarious, so we left before the girlfriend arrived leaving a chocolate bar in the mailbox telling her to go up stairs. We later got an email saying that she did indeed say yes and loved the proposal style!" I received a unique marriage proposal of my own, and it was through art -- namely 21 different illustrated proposal scenes featuring me and my fiancé that he had commissioned from 18 different artists and posted on Reddit for me to find during what happens to be my customary Reddit morning browsing routine. The proposal itself was surprising, unique, and breathtaking, and I love that the art will linger with us well after we are married and grow old. The internet loved the proposal, too (it went a bit viral) -- so much that my fiancé and I were inspired to open an affordable online art commissioning business: ArtCorgi. We now get marriage proposal orders all the time (and many orders in which people have artists re-create their proposal scenes). One of my favorite examples is one in which a client had one of our artists illustrate himself proposing to his girlfriend at the exact location along the California coast where he planned to propose to her. When they arrived at that spot on the day of their proposal, he presented his now-fiancée with an envelope containing the art, and as she discovered the illustrated scene, he re-created it in real life by getting down on one knee and popping the question. In a sense, he captured the moment of his marriage proposal before it even happened! A responsible choice may be to discuss marriage proposals before orchestrating grand romantic gestures and investing in expensive jewelry. This opens up the opportunity for both members in a relationship to plan formal proposals and surprise their partners with rings while still enabling them to move toward the good stuff (namely, taking the plunge and diving head first into married life). Tracy Osborn, the founder of the wedding planning website WeddingLovely did just that. "My husband and I eloped last March and he still owes me a proper proposal. We were in a stalemate for at least six months regarding marriage because I would bring up him proposing to me, and he'd counter with, "Why can't you propose to me?" as a joke. We kind of just made the agreement to get elope, and he says that someday he'll finally propose to me when I'm not expecting it." Ultimately, putting off your proposal can be the perfect excuse to jump straight into planning a unique, unforgettable wedding. And WeddingLovely offers the perfect resource for doing so. Were you the recipient of a unique marriage proposal? If so, how did you (or your significant other) pop the question? Share your story in the comments. 1. Estimate how many people you'd like to invite to your big day, since not all places can accommodate a wide variety of wedding sizes. Nearly every venue will have a guest count minimum: "Be sure to aim low in your numbers — it's easier to add guests than to deduct," says Diane Kolanović-Šolaja from Dee Kay Events. If your final attendance number winds up being smaller than you had anticipated and you have to pay for extra plates, she recommends asking the venue if they can throw in a couple more appetizers during cocktail hour or add extra time to the reception festivities. 3. "Check out wedding planners' and photographers' blogs to see real wedding photos of venues you're interested in visiting. Since they aren't staged, you'll get a much better idea of what things can (and really do) look like," says Kristin Crawford, W Austin’s Director of Catering and Events. It can be especially helpful if you are unable to visit the venue during the season you'll be getting married. 4. Choose your wedding date. "Wedding dates can be significant for a variety of reasons; some couples choose to wed on the day they met, their parents' or grandparents' anniversary date, or for auspicious reasons that numbers have in their culture or religion. Others may pick a specific time of year and season but not a specific day," says Margo Fischer from Bright Occasions. If you can be flexible with your date and choose an off-season month, you’ll often be able to secure the venue of your dreams at a lower rate. For example, you'd likely pay less for a Friday wedding in February than you would for a Saturday in June. Time of year, day of the week, and your engagement length will all impact your negotiating leverage with vendors. 16. Email or call prospective venues to schedule official walk-throughs with representatives who can answer all of your questions (come prepared with a pen and paper to take notes). If possible, try to make arrangements to visit the site when it's set up for a wedding. This way, you'll be able to assess the size of your reception area once all of the tables, DJ or band equipment, sweetheart table, and any other necessary components are set up. The event-planning team at Gramercy Mansion recommends, "Don't bring your entire family for an initial site visit. While it's great to have feedback from parents and your maid of honor, limit the first appointment to just you and your fiancé (and a planner, if you have one). Venue selection is a very personal choice, and it sets the tone for your entire event." 17. "Don't book the first venue you see. You may want to get it over with, but trust me. Select at least three places that may be a good fit for your budget and style; then write down the pros and cons of each one. I promise it will make the process easier and more fun!" Kolanović-Šolaja says. Plus, getting quotes from multiple venues will ensure that you're getting a good value. 18. Factor in all of the various spaces you will need (ceremony, cocktails, dinner, and dancing). Think about how to use the rooms and grounds for different purposes — there should be a seamless flow from one portion to the next. If you're getting married on-site, you'll save yourselves multiple site fees, as well as transportation from one location to the other. 20. Visit each venue with an open mind. Couples often end up booking a venue that looked so-so online because the photos didn't do the grounds justice, or they fall in love with something they didn't expect initially. 21. Ask for referrals. Many venues have great relationships with past clients who would be more than happy to let you know about their experiences. Ask about the service — was anyone difficult to work with? Or did they go above and beyond to ensure the event was a smashing success? How was the food? Was there anything they wish they would have done differently? 22. Pay special attention to the lighting. If a venue is too dark, it can make it tricky for your photographer to capture all of the details that you worked so hard to plan. You'll also need to find out whether the venue you're considering offers additional lighting services, such as uplighting, intelligent lighting, or projected gobos in-house, or if you'll need to hire an outside vendor. 23. Send a thank-you e-mail to the venue representative with a recap of what you discussed each time. This way, everything is in writing, and you won't forget. 24. Consider how guests will get from Point A to Point B. "Transportation and parking vary depending on whether you're getting married in a city or out in the country, whether the ceremony and reception will take place at the same venue, and whether guests are local or it's a destination wedding," Fischer says. If the venue you're considering doesn't offer overnight accommodations, research nearby hotels or inns, including how much they cost and whether they have enough rooms available. Is there on-site parking for guests at the venue, and if so, is it free or will you cover any fees? Is there nearby off-site parking, such as street parking or garages? If parking isn't readily available, are there valet options that you can provide for local guests (some venues charge extra for this) or will you need shuttle buses and/or limos for the bridal party? 25. Since weather can be unpredictable, it's crucial to have a contingency plan for an outdoor wedding. Before booking, ask what the plan is and walk through it with them. Make sure that you like the backup spaces in the event of inclement weather; if you don't, then you may want to consider another venue or hiring a planner to help out along the way. 26. Some venues offer an on-site coordinator to assist you once you get to the property. Usually, they will help set up your wedding and solve any issues that may arise. Since they don't offer the full range of services that an outside wedding planner would provide, it's important to determine what they're responsible for and whether you need to hire additional outside help. 27. Determine if there are any vendor restrictions. "Preferred" vendors are usually businesses vetted by the venue who work there often and know all the ins and outs of the spaces. "Some venues have strict policies on vendors and you may not be allowed to use the planner you wanted to work with or the photographer you already booked. Other establishments may use this list to suggest businesses they like to work with but ultimately allow couples to bring in other vendors," Fischer says. (More than likely, all the venue will need is proof of liability insurance from the vendor.) Have an open dialogue with your venue and go a step further to find out why they are "preferred." Is it because the vendor has experience working at the venue, or did they pay to be on the list strictly as marketing? "If it's the latter, you may want to search other vendors," Kolanović-Šolaja says. 28. If the venue offers catering in-house, find out if you can do a tasting before the wedding. Consider bringing your parents along to get their opinions, and keep your guests' tastes in mind in addition to your personal favorites. You'll also need to make the venue aware of any special dietary restrictions. Drink preferences may come into play as well: Are you and your guests connoisseurs of the vine, or are craft beers more up your alley? There's no need to break the bank on a premium bar if you won't be pouring fancy cognacs and vodkas. 29. Ask if you'll have exclusive use of the venue. It's important to know how many functions they'll have going on at once and how much interaction there will be between your guests and theirs (if any). The privacy factor differs for every space; some venues may offer separate restrooms and parking areas for guests from different events, while others have the rooms set close together, so you might hear someone else's music pumping from down the hall. If you're getting married outdoors in a public space, such as a park or beach, be aware that strangers may stop to give you their good wishes or find their way into the background of your wedding photos. 30. Venue packages vary greatly, including the amount of time you'll have for your party and any overtime fees. If the wedding has to end at 9 p.m. sharp because of noise restrictions but you want to dance until dawn, then you may want to keep the festivities going with an after-party elsewhere. 31. Your date isn't officially reserved until you sign your contract and, in most cases, make a deposit. 34. Don't get pressured into signing right away. If a venue has your desired date open, but you aren't ready to book, ask if they can place a soft hold or give you a courtesy call if someone else is interested in your date. (Some places may charge a small deposit fee to hold your wedding date if you haven't signed a contract yet, which is usually taken off the final bill.) Take a few days to talk it over with your fiancé and make sure that your financials are doable in the time frame that you have. 35. You will usually give the first deposit at the signing. Some venues will accept the first payment on a credit card, but after that, it will be cashier's check or cash, so be prepared when those payments are due. When I first started out as a wedding planner, I would take brides to look at invitations and there was always sticker shock when seeing the prices. I’ve learned since, what makes up these prices and ways to keep them down as much as possible. There are two options when ordering paper products. 1. STATIONERY SHOP – What you are paying for when picking a design from a local stationery shop with lots of books is the variety. If you’ve ever been shopping for stationery, you know these shops can have 30+ books each with 30 or more designs. The options are endless. Because the shop is not limited to an in house designer, they can carry tons of different lines. The price paid for this is usually double the wholesale price. But without them purchasing the books and making them available to brides, you wouldn’t have access to them. How to get the most? Utilize their resources to find exactly what you want. If you are picky but not hands on, this is a great option. It is a little less involved. Once the information is provided to the stationery shop, there is little left to do but pick them up when they come in. 2. STATIONERY DESIGNER – What you are paying for when working with a stationery designer is customization and direct communication and time with the designer. The process can be a bit more involved. This is a great option for those who may be more visual. Sometimes seeing what you thought you wanted is needed to decide on it. Being able to change your mind after beginning the process is possible when working directly with a designer. Most offer several rounds of revisions available to do any tweaking as you see proofs. How to get the most? If you’ve looked for the perfect invitation and can’t seem to find it, a designer and combine elements you may have seen or create a completely custom design for you. Along with these custom options, usually is a font library of tons of options. I can’t even tell you how much I’ve spent on fonts in the past few years BUT it adds value to the products I offer. 3. For both options, a big factor in price will be paper and print quality. The process of letterpress is extremely time consuming and is done by hand. You can expect to pay between $3-$10+ per invite for a letterpress invitation. The quality is top of the line. Flat printing is the least expensive because it is done by a machine instead of by hand. Ask to see options for the type of printing and paper you will be using to make sure it meets your expectations. How many invitation designs do you offer? What is the paper or print quality? I’ve learned so much watching some of my favorites in the local industry. I dabble in florals but there is SO much more that goes into even a simple bouquet then I realize. ​1. Before the wedding day, florists meet with the bride to discuss their vision. Many times, it doesn’t end when the meeting ends. They’ll search for the perfect vases or come up with custom designs. They spend a good deal of time finding the perfect flowers or products to incorporate. A week or two before the wedding, orders are placed for the flowers and when they come in the real work begins. Flowers are removed from the boxes, stems cut, petals opened. Sometimes this process even involves dying. Then they begin assembling. Flowers are so fragile. For many florists, ensuring a bouquet stays perfect for hours of heat and holding means wiring each flower in the bride’s bouquet. Along with the cost of the actual cost of the flowers is the obvious cost of labor as well as supplies, like ribbon, floral tape, etc. 2. On the wedding day, deliveries are made before the wedding. Depending on the ceremony site, there is very limited time for the florist to set up. They’ve got to have prepped everything to ensure they can get in and get out in a very short timeframe. For many florists, their day does not end once items are dropped off. They may need to wait through the ceremony to transport flowers to the reception as well as come at the very end of the night to get vases. And once again, florists normally work every single Saturday. I have so much respect for that! IN MY OPINION – Over the last few years I have seen all vendors raise prices, some very drastically, along with their cost of goods, etc. Florist seem to be the only ones that have not raised their price much, if at all. Part of this I’ve heard comes from everyone’s assumption that flowers are already seen as higher than normally expected by clients. Some florists may be afraid to further alienate clients. BUT the fact is, their cost of good, especially flowers are raising. Brides, remember if you are booking a traditional flowershop, instead of ordering flowers online, their products are top of the line as well. In your head, you may do the math. 10 packs of a dozen roses from Albertson’s is $100. What size are bouquets? Centerpieces? Etc. Slimming down the same version can save. The number of girls you choose to include in your bridal party can reveal a lot about you as a person, as well as your likes and hobbies. Whether you're going big or keeping it super small, find out what your bridesmaid count says about you. You're the social butterfly of your clique and always like to keep a gaggle go girls around you to ham it up with. Your motto in life is to work hard, play hard and that you do! After a long day at the office, you can either be found partaking in happy hour, meeting up with your meetup group or hosting a dinner party with your besties and their significant others too. You're charming and utterly irresistible so it's no wonder people are naturally drawn to your bubbly energy. You're a modern day nomad with besties scattered all across the country. Some may say you're indecisive, but your friends mean the world to you, and there's no way you could picture saying I do without them all standing by your side. You jump at the chance to take girls' vacays and enjoy gossiping about everything from celebrities to fashion to fiancés with them. Others would definitely describe you as outgoing, fun to be around and even the life of the party from time to time. While you love socializing and hanging out with your friends, you also like your alone time and can get overwhelmed when there's too many people around at once. Your bridal party most likely consists of your sister or your sister-in-law, your BFF since childhood and a few other ladies you've know for years and are currently still close to. You may have been a dancing machine once, but now you enjoy drinks and dinner (and brunch, of course) with the girls on the weekend. You couldn't decide between your group of girls so you simply opted to ask your two sisters instead. That doesn't mean you won't have your high school besties stop by for a quick champagne toast before the ceremony though. You're fiercely loyal, all about family and would do anything for the people you love in your life. In your free time, you like nothing more than hitting up a local museum, going to an art show or even checking out your favorite up-and-coming band at a dive bar. On the other hand, you're also completely happy having a movie night in with your man. You march to the beat of your own drum, and as far as tradition goes, you're certainly not afraid to break with it. Of course, you have several close friends you could ask, but your wedding is small and you really want the focus to be on you and your fiancé. That's not to say you like being the center of attention though; in fact, it's quite the opposite. Small talk totally isn't your thing, as you much prefer deep conversations to mindless chitchat. Taia Younis of Inspired Occasions founded her wedding and event planning business on the sheer pleasure of making a bride’s fairy-tale come true. Creating fairy-tales is a business that is very personal for Taia, so when a bride comes to her with questions, she answers with the honesty and guidance of a best friend. A common question Taia handles is whether or not a bride should pursue hiring a wedding videographer. The wedding professional uses her personal experiences to provide 5 key reasons every bride needs a videographer. Video provides something photographs cannot. “I was at a wedding and a little boy wanted to get up and toast the bride and groom,” explained Taia. “So when he got up there he started to sing his A, B, C’s. It was adorable. The photographer had the images, but no one had the ability to hear his voice ever again during that moment. There was no video. ” It was something the bride and groom lost out on and could never recreate. Audio details can quickly fade from memory and video allows couples the chance to hear it again for the first time. A wedding is a gift that a bride can not only give herself, but her family and future children as well. “When we hired our videographer, my children weren’t even a thought. But, now my children can be guests at my wedding. They can see what their dad and I looked like 15 years ago, they can feel the emotions of that day and hear the things that were said. We have watched it many times together,” said Taia. The wedding video will remain in her family as something that can be passed down. The video also has the potential to serve as a living memory for those who have passed on. It gives family a chance to see and hear those people again. In the future it’s a chance for grown children to go back and look at themselves at a time when they were young. It simply provides a way for time to stand still and give family a chance to reflect and remember. Bridal Tip: Hire a videographer! “I truly think it is a shame if a bride decides not to hire a videographer, the memories fade, but they don’t have to if they are captured in video.” – Taia Younis, Inspired Occasions.